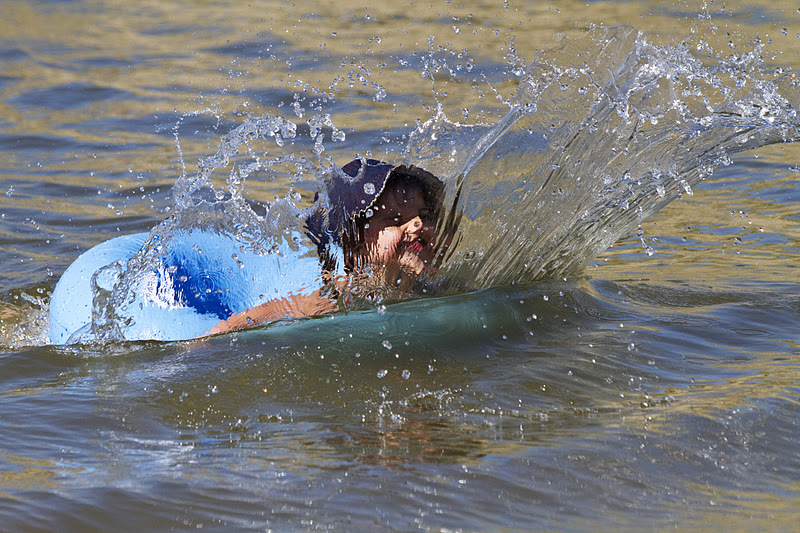 I can’t think of anything that makes my children and myself happier than playing in water…I mean, take a look! 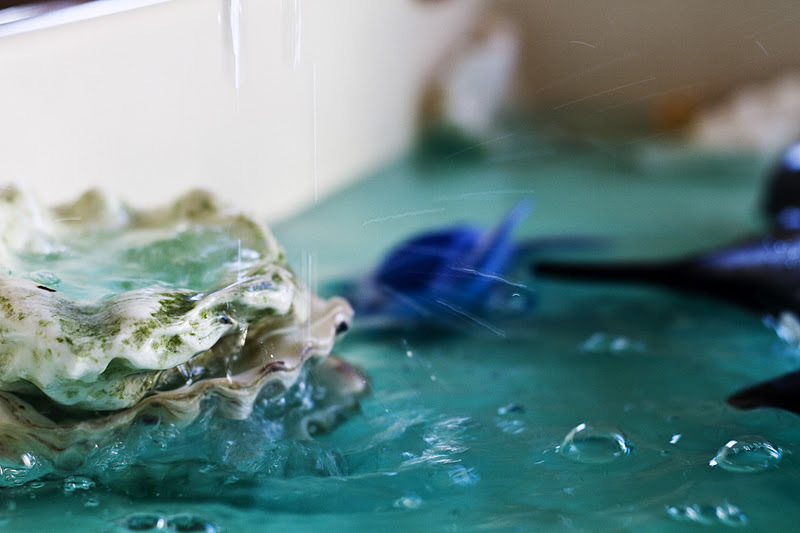 What is more fun than a good splash? So why don’t we do it more often? Because it’s cold outside? It’s not summer anymore? Ha! Bring it inside! Because it’s messy? Boo! There is nothing cleaner than water! Because it’s too much work? Phooey! Since when was fun too much work? 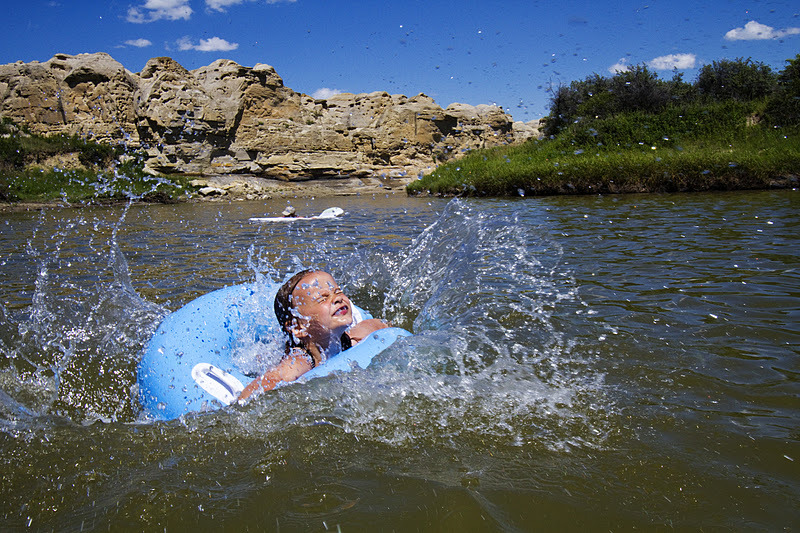 There is no other medium out there that is more beneficial to play in, than water. 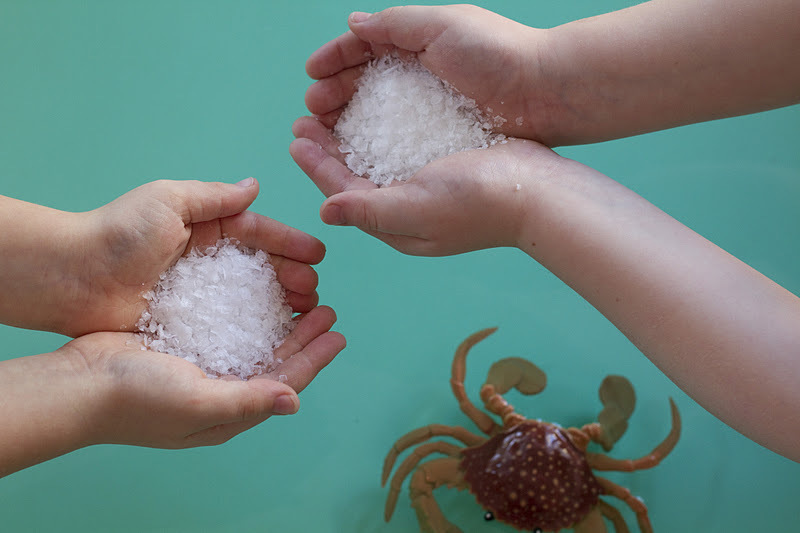 It’s an all-sensory experience…feeling, tasting, smelling, seeing, and hearing, Fine motor skills are honed by pouring, squeezing, and swirling. Cognitive skill are developing as they measure, mix, and imagine. 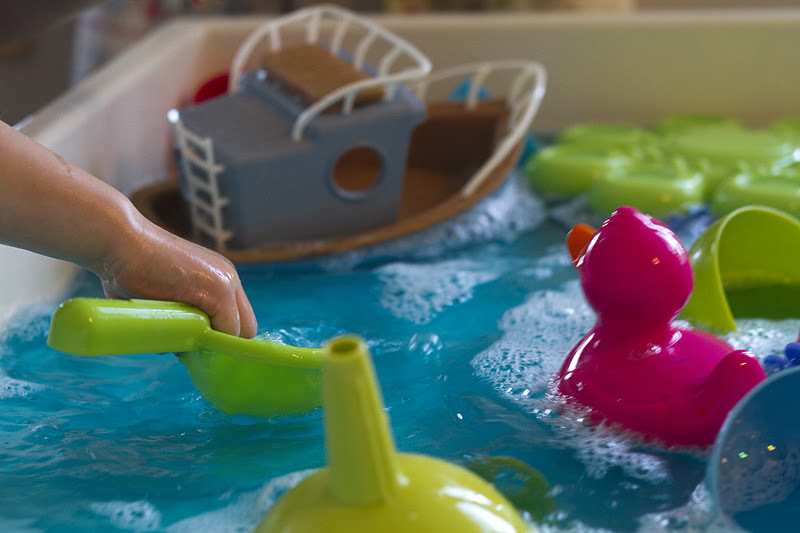 And don’t forget the emotional side of water play. How often are your raw nerves soothed by an evening bubble bath? How often are you refreshed and energized by a morning shower? 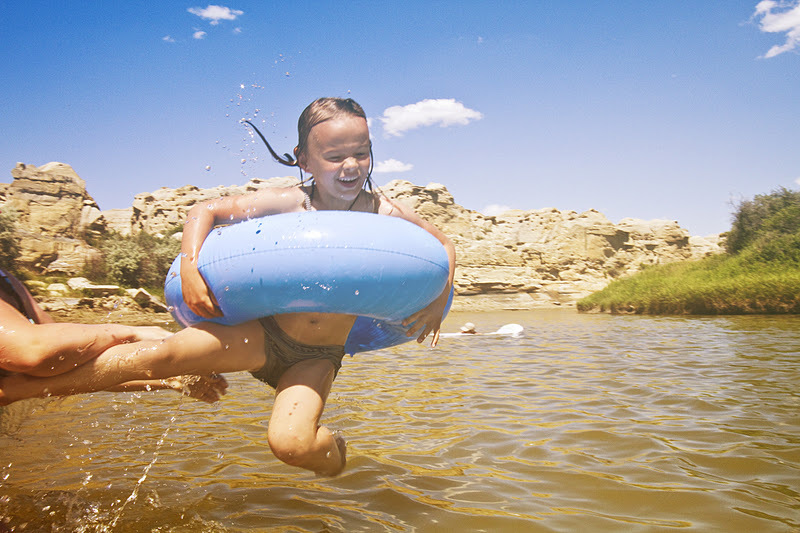 Being in, and playing in the water can change a child’s emotional state in just a few minutes. So, no more excuses! Get playing! It doesn’t have to be complicated. 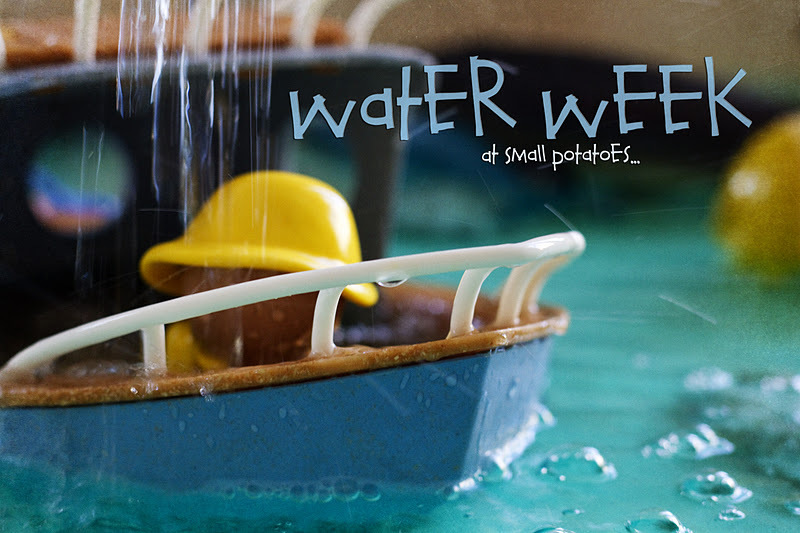 A simple bin full of water, measuring cups, funnels, and tub toys would do the trick! 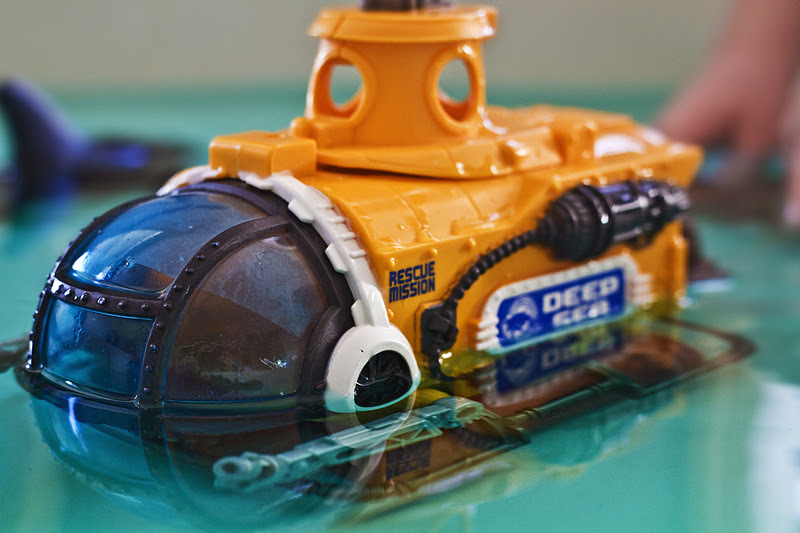 For those of you who want more ideas for playing in water, the next few posts will be just the thing for you! I am going to divide this post into 6 parts, so it’s not so overwhelming. One activity per day. And I’m not saying you have to DO the activities 6 days in a row! I’m just going to give you a new idea each day so it’s not all piled up in one giant post! 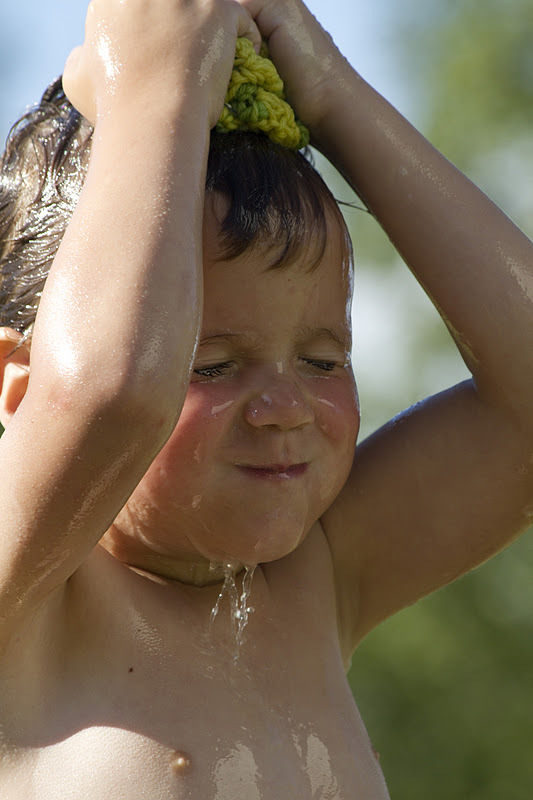 That’s 6 days worth of water play time coming up…are you ready to get wet?? 1. 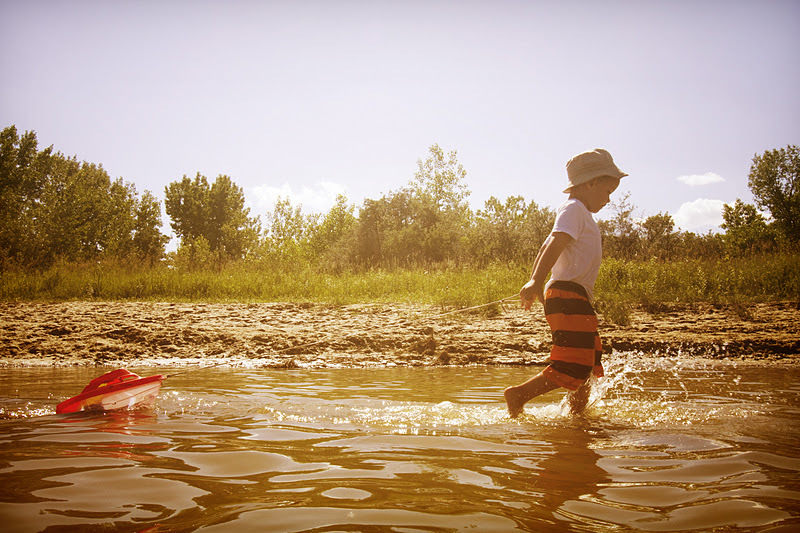 A plastic washtub, bin, or water table. 4. Blue and green food coloring..we mixed a bit of both to give it a mediterranean feel. 6. You can also put sand on the bottom of your bin if you want it really authentic. 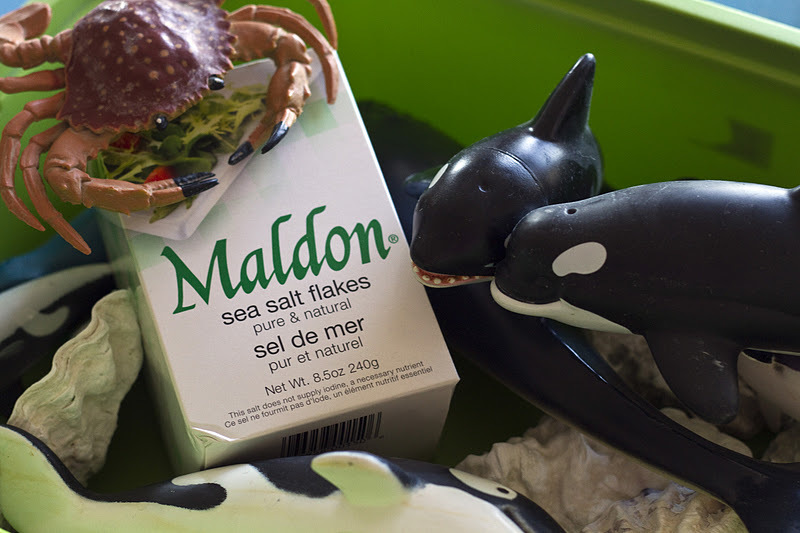 Color your water, add the salt and critters, and you are ready for some great imaginative ocean play. 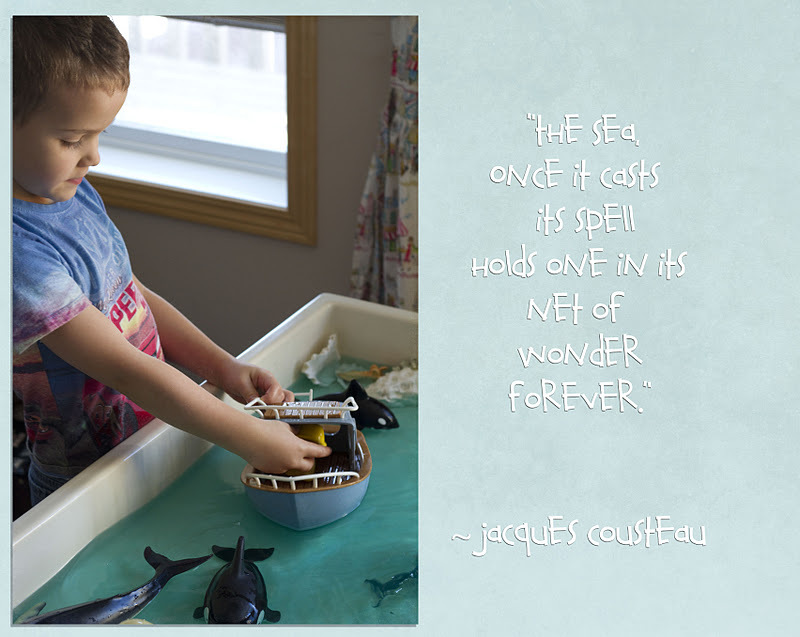 I know many adults who long to see the ocean and be near it every day. Children are no different. The ocean holds a special magic that soothes and delights. Why not bring it into your own kitchen for a day or two? 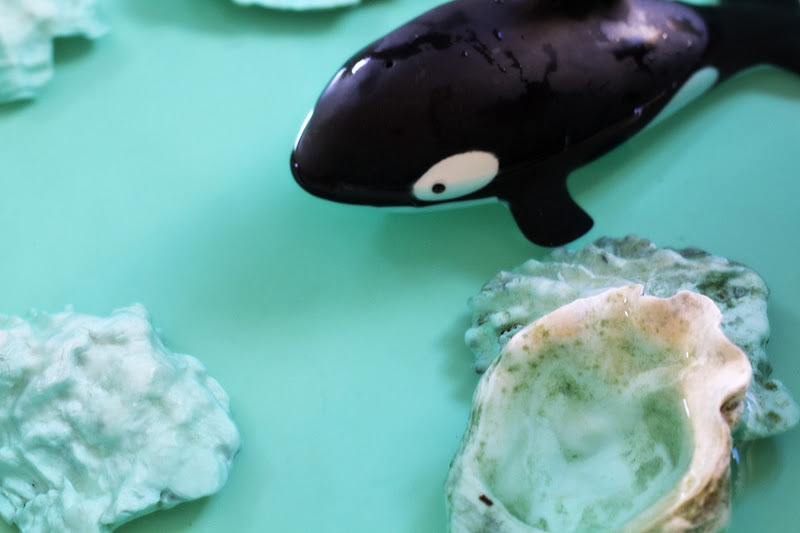 And if you have a cd or itunes track with whale or ocean sounds…put that on in the background to create an even better, all-round sensory experience. 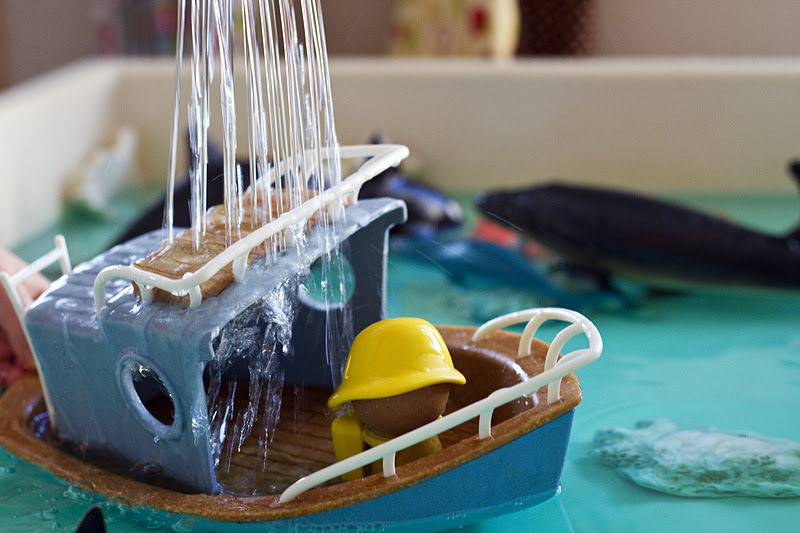 I’ll see you tomorrow for another water play idea! awesome. Just the pictures alone, made me feel better! Thanks, Erin! This is the post that sparked the instagram photo this morning. I was missing the real thing!! wonderful photos. Where you live? Ceylin’in, I live in western Canada!